Name Every Note on the Guitar in 10 Easy Lessons! How well do you know the guitar neck? Would you like to find notes instantly anywhere on the guitar neck? Do you want to improve your playing and open new musical possibilities? Very little experience is necessary to learn the notes on the guitar. Can you play a "G" chord? How about the introduction to Smoke On the Water? Then chances are you can learn the guitar neck. The two prerequisites are a strong desire to learn and the dedication to stick with it. Oh yeah, you also need a guitar and a membership at guitargames.net. Guitar Flash CardsGet Started by registering for a free membership. Try out a few of our games, like Guitar Flash Cards and Birds of Fretopia which are used in the 10 Lessons. Then signup for a membership, download the 10 Lesson E-book, and start learning all the notes on the guitar! This series of lessons will teach you all the note names on the guitar neck. It takes a unique and fun approach to learning the neck. But don't let the fun fool you. Behind our method is a well researched system that will have you learn and (here comes the important part) remember the guitar neck for the long term. The system does not cover reading music, forming scales, chords, etc. But, it will make learning and playing just about anything on the guitar a whole lot easier. Why learn the note names on the guitar? Knowing the neck allows players to be able to play music on any part of the guitar. It helps players make fewer mistakes and not get lost. It opens up new possibilities for writing music, scales and chords can be found with greater ease, and learning as well as remembering music is made simpler. This system was developed based on extensive research into how our memories work and how people learn. It teaches you the basic organization of music and how it applies to the guitar fretboard. 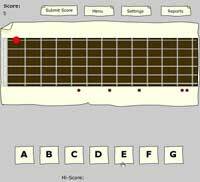 The lessons combine online and written activities with playing the guitar. You will learn three landmarks on the fretboard and make use of easy devices for memorizing large amounts of information. This is not a “miracle product,” it is a solid approach to mastering the guitar fretboard. Begin today! Do one lesson a day and you will be done in a week and a half. The lessons can also be spread out for those short on time. Each lesson should take between 30 to 45 minutes. To write a review please login or register.